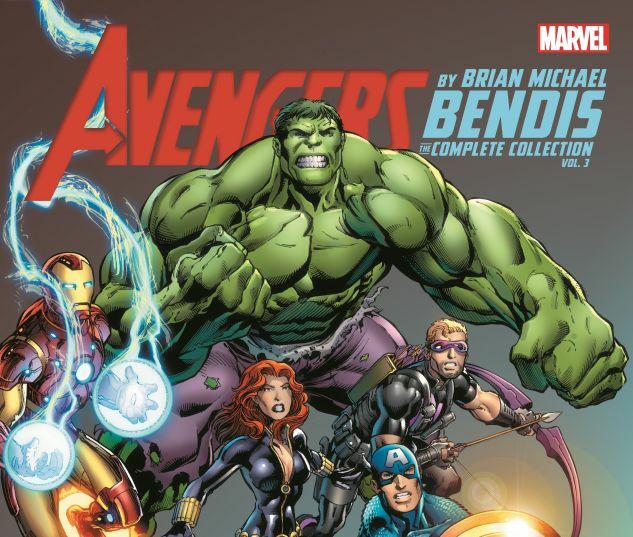 'The Avengers by Brian Michael Bendis: Complete Collection Vol. 3' review: A hit and miss culmination of Bendis's time at Marvel – AiPT! A celebration of Bendis’s time at Marvel. Over the past couple months, Marvel has been putting out monumental collections of Bendis’ infamous run on Avengers and New Avengers. Given the current state of Marvel comics, one could say the collections reflect a brighter and more cohesive time for the company. So is this culminating collection any good? This is the third and final Bendis collection for his Avengers run, which shouldn’t be confused with the seventh and final Bendis collection for his New Avengers, run which I reviewed a few months ago. The collection is hefty and certainly worth the price at face value, featuring 456 pages which weighs in at two pounds. The collection follows similar trends seen in the previous collection with an emphasis on younger heroes and newer faces. There are various artists featured — none as polarizing as JRJR — but with such a vast spectrum of artistic styles there are going to some you enjoy more than others. The largest difference between this collection and the previous is the number of different series it features. Rather than just collecting the last of the main Avengers series (#24.1 – #34), Marvel also included Avengers Assemble (#1- #8) as well as other one shots such as Avengers: Heroes Welcome and Cyclops vs. Captain America. While I enjoyed the main Avengers title and the culmination of Bendis’ arc and the rest of the one-shots, Avengers Assemble was a pretty rough go. It truly feels like a B level series, especially when read immediately following the lead title (it’s like the “Fruit Rings” knock off of “Fruit Loops”). While it does feature Thanos, his cameo can’t make up for the gimmicky quips, the subpar villains, and the overall dullness of the storyline. The main Avengers title however, which thankfully makes up the majority of the collection, are a nice way to finish off the collection. The storyline follows the reintroduction of The Vision, the Avengers Vs. X-Men crossover event, the battle against the Phoenix Force, and the rescue of an Avenger from the Microverse. While Bendis’ New Avengers collection suffered during this crossover event, his Avengers’ storyline is more coherent without the support of the tie-in issues. Even when battling the Phoenix Force and the X-Men, Bendis continues to give characters such as Red Hulk, Spider-Woman, and Noh-Varr as much panel time as the traditional, core group of Avengers which keeps things fresh and new. I’ve been shocked at how many artists have been thrown on the illustrative turntable that is the Avengers series — this collection features a total of seven artists between all of the various works included. Some of the most notable works are penciled by Brandon Peterson who stays on for a handful of random issues. Between his pencils and the incredible shading and colors, we’re given some great splashes and spreads to ogle. This standard for coloring and shading is consistent throughout the collection and while none of the artwork is poor, Peterson’s pencils clearly stands out. I’ve now read three consecutive collections of Bendis’ Avengers work and what I’ve learned over the last 1,000 pages is that Bendis is (or should I say was, with his recent move to DC) able to develop likable, authentic characters that feel real. Bendis is comfortable with integrating humor to give the comic a lighthearted tone without making it a “comedy” or feel ridiculous baring a select few story arcs (one of which is Avengers Assemble). With so many team-dynamic stories, whether it’s Avengers, Defenders, or any other hero teams, it always feels like the members are locked in an unspoken contest of stoicism. Most of these heroes are human and desperately need to show a little humanity. Brian isn’t afraid to have his characters show emotion or discuss real life topics, and that’s what makes them so appealing. Marvel has finally completed Bendis’ complete collection and it comes at a fitting time with his move to DC. The arcs included aren’t his shining moments, especially the eight-part Avengers Assemble series, but it does end on a good note and makes for a nice celebration of what Bendis did for Marvel. It's a good, but far from perfect representation of Bendis' work with the Avenger series.